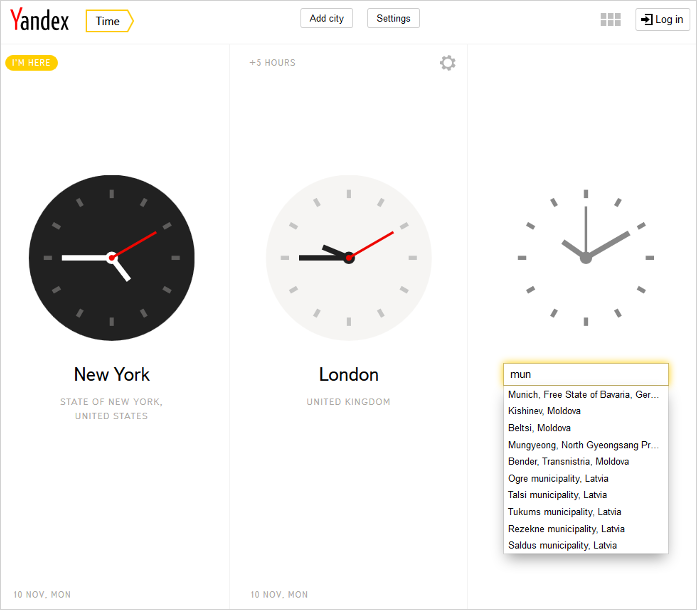 Yandex.Time is a service that helps you determine the time in any city or time zone in the world. 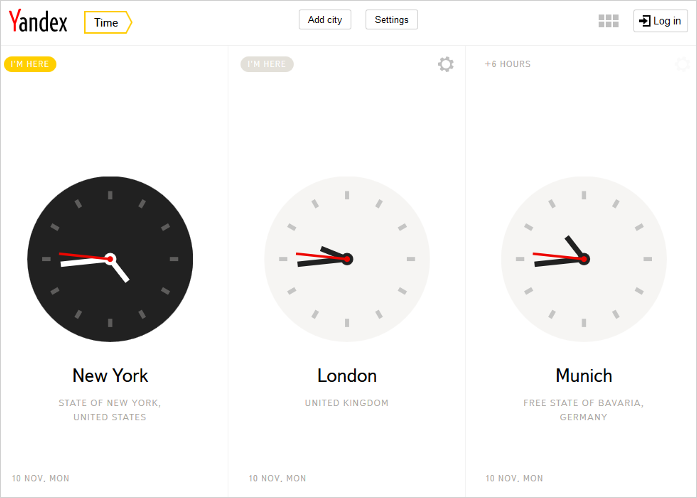 You can also use this service to figure out the time difference between two cities, countries, or time zones. 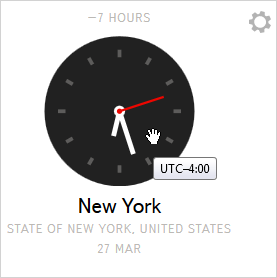 The service automatically shows the current time in the major cities of Moscow, New York, London, Tokyo, and Sydney. 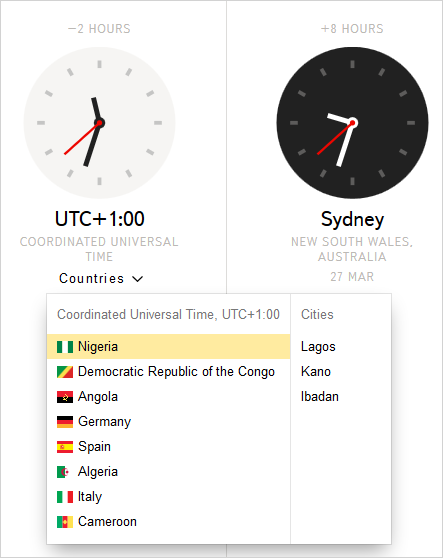 You can choose any cities or time zones to view the current time in the places that matter to you. You can add as many clock-faces as you'd like. Click on Add city. 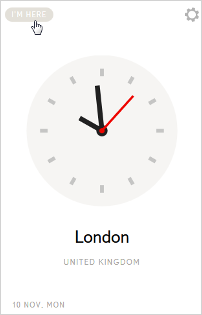 A blank clock-face with a search bar will be added to the page. Enter the country, city, or time zone name. Search suggestions will appear as you enter text and can help you find what you need in one click. Note. You can enter the names of cities and countries using the Latin or Cyrillic alphabets (Лондон, London). Time zone names can only be entered using Latin letters (UTC, gmt, MDt). Click on in the upper right corner next to the clock-face. When you hover over the clock-face, a hint is displayed with the city's time zone (using the Coordinated Universal Time UTC format). You can see the full name of the time zone (international name in English) under the clock-face. To see the list of countries for the selected time zone, and the major cities in these countries, you can open up the Countries list. You can find the difference between the time shown on the clock-face labeled I'm here and the times shown on other clock-faces. The label is shown in the upper left corner next to every clock-face. Note. The I'm here label is set to your city by default. The I'm here label can be set for a different clock-face. 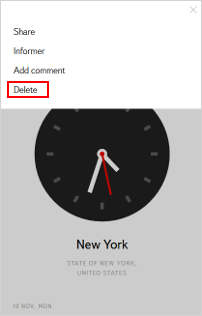 Just hold the cursor over the time difference next to the appropriate clock-face and then click on the sign that appears. Note. After setting a different city for I'm here, time differences are re-calculated automatically.